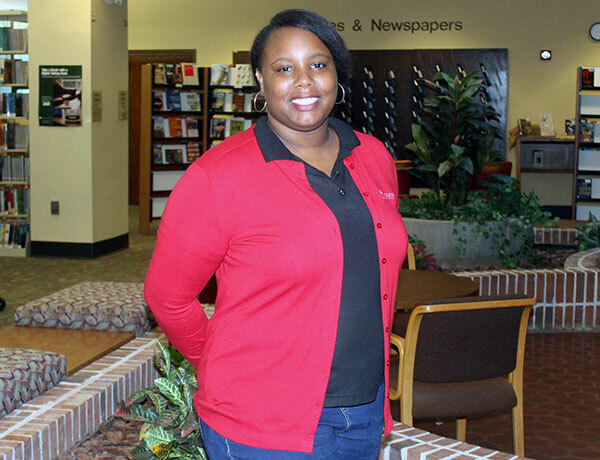 MGA grad Alexandria Hughes is marketing coordinator for the Middle Georgia Regional Library. Employment: Marketing Coordinator for the Middle Georgia Regional Library. MGA Degree: Bachelor of Science in New Media and Communications, Class of 2015. "As the marketing coordinator, my job is to help communicate the library’s mission, its efforts and initiatives to improve literacy throughout the community and connect people to the information necessary to improve their lives through excellent services and materials. I communicate what those services and materials are and share news about library events, library success, and other important news. What I love most about my job is the personal and professional growth that I get from doing it and the ability to help make members of the community aware of resources that are available to them." "People are always talking about how tough the school is, and to an extent they are right. But I feel like MGA whipped me into shape to get me ready for the 'real world.' While I was in the midst of striving towards my degree, I had my positive experiences and my not so positive ones. Now, as I continue this journey through 'real life,' I feel like I can take it on because I feel my University prepared me for it. I work in a position where I have to manage multiple projects and assignments at the same time and meet deadlines - and I can handle it. MGA provided me with educators that instilled me with the skills and strengths that I need to do this job. I can do public speaking now, I can effectively research subject matters that I don’t know a lot about, I can enter into a conversation with strangers and not feel (as much) social anxiety. I’m more culturally aware and open-minded to new experiences. I can take on challenges head on and conquer them. If there is a moment I 'failed' I can assess what went wrong or could have been done differently and tackle it again. That’s what the professors and even Student Life staff at MGA gave to me." "I see myself living life to the fullest. I see myself more polished in my skillset and more engaged in my community. I see myself traveling and spending time with family and friends. I see myself doing some form of education, however, I’m still deciding on that path, so stay tuned for that. I know that I want to teach, I just don’t know for sure where I’ll end up. But that’s the joy of life, isn’t it? The unpredictability of it all."